The Macy-Colby House is an 18th-century early-American, second-period house located at 257 Main Street, in Amesbury, Massachusetts. We are opened Saturdays Memorial Day through Labor Day from 10:00 am to 2:00 pm or by appointment at 978-388-3054. In 2008, the Macy-Colby House was placed on the National Register of Historic Places. As one of the oldest houses in Amesbury, Massachusetts, it was recognized as a historic landmark and therefore, shall be preserved and maintained for future generations. It joins other National Register sites in Amesbury such as Lowell's Boat Shop, the Quaker Meetinghouse, Rocky Hill Meetinghouse and the John Greenleaf Whittier Home. The Macy Colby House is one of the oldest houses in Amesbury, Massachusetts. 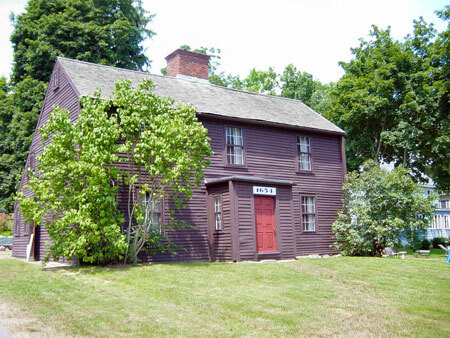 The mission of the Friends of the Macy Colby House Committee is to preserve and exhibit this 18th-century Amesbury home, to be its stewards for future generations, and to foster an appreciation for our local history. Established in 1888, the Bartlett Cemetery Association took ownership of the Macy-Colby House in 1899. It maintains the upkeep of the property and provides guidance in it preservation. The Josiah Bartlett Chapter of the Daughters of the Revolution organization was established in 1896 to foster patriotism and to maintain the graves of Revolutionary War soldiers. The "Daughters" maintained and displayed the Macy-Colby House until 1980 when the organization was disbanded and replaced by the Friends of the Macy-Colby House Committee. The purpose of the Friends of the Macy-Colby House Committee is to preserve and respect the rich history of Amesbury, Massachusetts through the preservation of the Macy-Colby House and to share these values with our community. The organization was started in 1983. Membership is opened to all who share an interest in our mission.